If you can read this, you have all the chops you need to read music. Really. 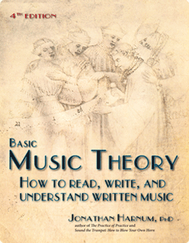 Basic Music Theory has short, easy chapters, designed for real students by a real teacher (that's me) with decades of experience, and a PhD in music education. This book is a frequent #1 best-seller in Amazon's "Music Instruction & Study." That kind of quality can't be faked. This book will help you learn to read music. Find out more, read reviews, and get samples here. Do You Wish You Could Read Music? Finally someone came up with a basic music theory book that's actually understandable and readable. Dr. Harnum explains complicated concepts in a way that even someone like me without any music background can easily understand them. I am looking forward to playing an instrument thanks to his help. This is by far the best music theory book I have ever read!